L to R standing, Alita Villa-Hipol, Mae Villa-Blando, Cecile Armada, Myrna Villa and seated, Vivelyn Reteracion-Espinosa. INDUCTION OF OUR NEW OFFICERS! 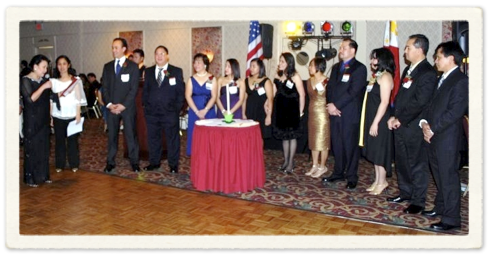 Honorable Consul General Cecilia Rebong inducts our JANA officers for 2009 to 2010. To the newly elected officers, you have been chosen leaders to unite Janiuaynons into a strong spirit of cooperation. and to engage in projects that seeks to benefit your hometown in Janiuay. As you assume your offices, you assume a special responsibility to promote the ideals of the Association. I encourage you to engage in dynamic leadership, finding strength in each other, and reaching out to serve all your members and your hometown in Janiuay. Our Honorable Consul general Cecilia Rebong proudly inducts our officers. MABUHAY PO KAYO, MABUHAY ANG PILIPINAS! Janiuaynons in the US, all over the world and for Janiuay. important event meaningful, memorable and inspiring. teach our children the positive values and strengths of all Janiuaynons. them kag ang pinalangga naton nga banwa sa Janiuay. We have started two projects for this purpose. We also would like you to get involved: MAGBUYLOG! Thank you and may we all have a wonderful night! Bondak mga Kasimanwa! are discussing plans for this project in our next meeting on March 28th, 2009.
you posted about the developments of this project that you have inspired. Thank you very much again for your inspiration and your support. Welcome mga Kasimanwa kag mga Bisita. Manny Sagun, President of the Philippine American Association of the Bronx, Inc.
let us unite and work to benefit ang pinalangga naton nga banwa sa Janiuay! PRO Pertz Villadarez, Elmo Barranco. Kilala ninyo man sanda sigurado. Turing Padoginog and his lovely wife enjoying the moment. Holiday Inn spacious hall, gutok gid ka Janiuaynon. We miss you all Janiuaynons out there. Ugyon ta liwat ? Himu-on ta duha ka adlaw ang Ugyon para sulit sa sunod. Agree kamo? We are all proud Janiuaynon ! After UGYON... @ the bar. Nami gid kung giya kamo tanan. & UNITING OUR KASIMANWA FOR UGYON JANIUAYNON 2009. Our JANA Vice President for New York, Cesar Billena and his wife Christine @ UGYON JANIUAYNON 2009. Our JANA Auditor Roy Armada & his lovely wife Judy @ UGYON JANIUAYNON 2009. 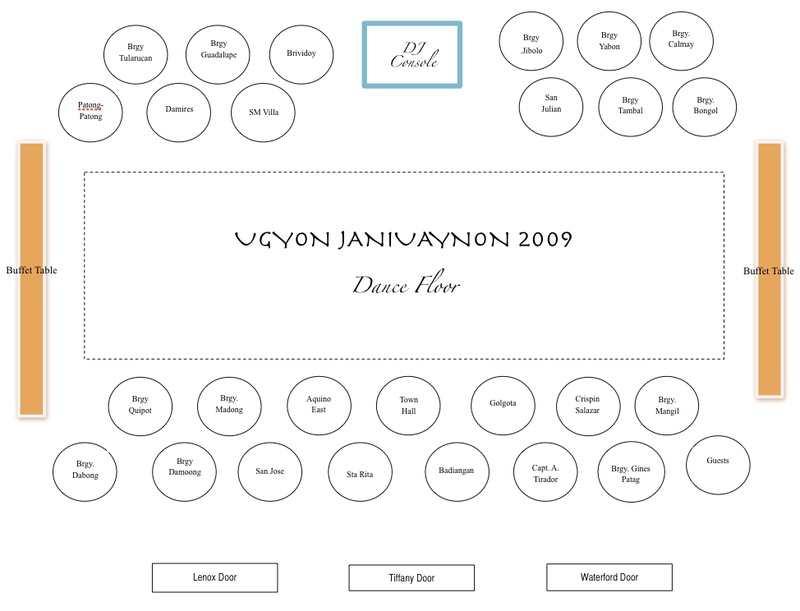 Our JANA Secretary Vivelyn "Bebing" Reteracion - Espinosa and her husband Leo @ UGYON JANIUAYNON 2009. OUR SOUVENIR SPONSORS LIST : SALAMAT GID KANINYO TANAN. MORE GUESTS FROM BADIANGAN... THANKS TO PERTZ VILLADAREZ FOR THE PHOTOS. OUR GUESTS FROM BADIANGAN... TRULY OUR KASIMANWAS GID SHARING & CELEBRATING OUR COMMON HERITAGE - ANG MARAGTAS SANG HANIWAY. SALAMAT GID SA ENCOURAGEMENT NINYO AND STRONG PRESENCE OF SUPPORT. THANKS TO P.R.O. PERTZ VILLADAREZ FOR THE PHOTOS. MORE PICTURES FROM THE RETERACION - ESPINOSA FAMILY. SALAMAT GID. OUR JANA SECRETARY, BEBING (RETERACION), LEO ESPINOSA WITH FAMILY. NANAY LUZ AND FRIEND REPRESENTING BGY. TAMBAL IN THE HALL. MAPASALAMAT ANAY KITA SA TANAN NGA NAGBULIG KANATON TANAN. TO OUR HONORED GUESTS & FRIENDS SALAMAT GID. Officers and delivered a heartwarming message to Janiuaynons. PICTURES COURTESY OF SO MANY KASIMANWA. CEZAR B. THANKS FOR SHARING. THE PAINTING COMES TO LIFE. WOW! HELLO TO ALL JANIUAYNONS ! WE MISS YOU. NALIPAT DUN KO NGARAN NA PAY CLASSMATE KO RAN SANG ELEMENTARY. THE AQUINO NOBLEZA WEST BOYS, KAMUSTA GID SA TANAN DYAN SA KALYE TA. OYA SOLANA, EDGAR PORRAS, TURING PADOGINOG, VP CEZAR BILLENA, GOYO VILLA, DR. RICKY ZARCO, BOBOT VILLA. KODAKI DUN KAMI. JANA PREVIOUS PRESIDENT IKE BUSCAR WITH EDABEL BILLENA AND HER FAMILY. SIGE LANG BASTA YUHUM DAYUN... DASIGA. GRABE BA... MAY JOURNAL PA SANDA... DIIN DUN ANG AKON MAN. HAPPY TO BE HERE... NO REGRETS. MABUHAY TO ALL JANIUAYNONS, TO ALL PINOYS. ENJOY MORE PICTURES COURTESY OF OUR KASIMANWA NGA MAALWAN MAG PADARA..
WE WOULD LIKE TO THANK THOSE WHO SEND THEIR PHOTOS GIYA. ANG MGA PICTURES NINYO WILL SURELY BRING JOY AND INSPIRATION SA MGA KASIMANWA NATON SA IBAN NGA PARTE KA KALIBUTAN, UMPISAHAN TA SA JANIUAY, SA BILOG NGA PILIPINAS, SA MIDDLE EAST, SA EUROPE, SA HONG KONG, SA SINGAPORE, SA KOREA, SA AUSTRALIA AND NEW ZEALAND. THIS IS ONE OF OUR DREAMS GID TO LINK US ALL THROUGH UGYON JANIUAYNON. ENJOY MORE PICTURES COURTESY OF SO MANY KASIMANWA NGA MAALWAN MAG PADARA.. MORE PHOTOS TO COME. PARA SA MGA KASIMANWA NATON NGA GUSTO MAN MAGBASA KA INDUCTION CEREMONY. WITH OUR HONORABLE CONSUL GENERAL CECILIA REBONG. We also would like to call our Board of Directors, please stand to be recognized and in support of our newly elected officers. And we would like to recognize our advisers, please stand to be recognized and in support of our newly elected officers. And now we call on our Inducting Officer, the Honorable Philippine Consul General for New York, Ms. Cecilia Rebong to preside over the induction ceremony. Inducting Officer: Tonight we are here to induct the new officers of the Janiuay Association of North America for the term of the years 2009-2010. Before we proceed let us express our appreciation for the 1st set of officers who organized and started the association. Our generous thanks for all their significant efforts. As a community, you have all put your trust in your new officers as leaders of your hometown association. You all have the common cause of working together to promote brotherhood among Janiuaynons, your kababayans and other ethnic groups in the United States of America. To the newly elected officers, you have been chosen leaders to unite Janiuaynons into a strong spirit of cooperation. You are now charge to lead the Janiuay Association of North America into a dynamic group that seeks to develop the educational, cultural and social growth and development of your members and to engage in projects that seeks to benefit your hometown in Janiuay. I will now ask you to light a special candle on this table. The light from this candle represents the collective wisdom and fellowship of the association as you endeavor to work and achieve the goals of the Janiuay Association of North America. Public Relations Officer, Ruperto Villadarez, Jr and Asst. Carmeda Brana-Padilla, you have the special duty to act as a liason officer of the association and welcome members and guests. Auditor, Roy Armada, you have the duty to perform audits and certify the association’s financial records to their accuracy. Secretary, Vivelyn Reteracion-Espinosa and Asst. Mary Irene Macaya, you have important responsibilities in communicating with members and keeping the records of the association. President, Raul Tirador, Jr., you must exercise the strength the power of your office in the best manner, using it to encourage and help your co-officers and members and leading the association into a strong spirit of unity and cooperation. Use the strength of your office to uphold the integrity and ethics of governance. As you assume your offices, you assume a special responsibility to promote the ideals of the Association. I encourage you to engage in dynamic leadership, finding strength in each other, and reaching out to serve all your members and your hometown in Janiuay. Duly elected officers, as I read your commitment, signify your agreement with a simple I do. Elected Officers, do you solemnly promise to fulfill the duties of the offices to which you have been elected, keeping in mind the purposes of the Janiuay Association of North America and upholding your responsibilities to the best of your abilities. If so, please answer I do. Having heard these elected officers’ commitment of dedication, I now declare that the Officers of the Janiuay Association of North America are duly inducted. Mga kababayan, please greet the new officers. Congratulations to all of you. MORE PICTURES WILL BE POSTED HERE SOON... HALIN SA MGA KASIMANWA NATON. SEND YOUR PICTURES VIA EMAIL AT admin@janiuay.net OR IF YOU HAVE UPLOADED YOUR VIDEOS IN YOUTUBE, PLEASE SEND US THE LINK. SALAMAT. Photos courtesy of the Villadarez Family. JANA OFFICERS AND MEMBERS WISH TO THANK ALL UGYON JANIUAYNON SUPPORTERS AND FRIENDS. BELOW IS JANA'S PRESIDENT THANK YOU NOTE. Ugyon Janiuaynon 2009 was a great success, something that we Janiuaynons will always be proud of because everybody came forward and gave their best! Salamat sa mga nag-attend, especially sa mga taga-out-of-town, may mga bisita kita halin sa Virginia, Washington D.C. Maryland, Atlantic City, Upstate NY, Connecticut, salamat sa mga kasimanwa nga nagday-off para makajoin sa ugyon kag magbuylog. Salamat sa mga kasimanwa nga nag-dara kang guests sa event. Your coming made a whole lot of difference! Our Consul General stayed because of our warm fellowship! Cezar Billena - Pre, Salamat guid katama, for bringing the highest number of guests and the highest number of journal sponsors!. Bringing Presidents of other organizations and hometown association sa "Ugyon Janiuaynon 2009" made our event impressive and introduced us to the rest of the Filipino Community in the Northeast. Thank you so much for staying up past six a.m. in the morning just to see our last guest leave the hotel. Josette Armada-Quenere - Thank you so much for coming early to help sa aton nga programa, salamat sa pag-usher mo sa mga bisita kag sa pagdara mo kang mga paryente kag guests sa event. Ang buruligan guin buligan mo guid. Bebing Reteracion Espinosa, bisan nga naga busong ikaw you are still there to help out and welcome ang naga arabut nga mga kasimanwa and guests. Salamat kay Leo Espinosa sa pagsuporta kanimo sa aton nga mga preparation, kag sa pagsolicit kang mga sponsors sa souvenir journal…to quote you "To ano pa guid ang mabulig ko, just let me know". Salut guid ako kaninyo. To Duloy and Josephine Reteracion, for giving our Philippine Consul General a warm welcome. You made her stay almost to the end of our program, daw color guards lang kamo sa pag-usher kag pagdul-ong kana in and out of the hotel ballroom . Na-entertain guid ninyo nga duha ti husto. Mae Villa-Blando, for preparing the corsages, buttoneers, led the welcome committee, suggested that each tables would be named after the barangays and donated the frames placed in each tables with the barangay names. Salamat guid sa pulaw mo. Alita Villa-Hipol, thanks for coordinating all the Officers and Board of Directors, for soliciting raffle donations, for working on the most challenging job of seating arrangement, for making all the errands to the Philippine Embassy, Banks, Holiday Inn. To use your qoute "hambali lang ako kung ano ang himuon ko pa and I will do it for you". I can't say "THANK YOU" enough. Jerry Hipol - for being there with your lovely wife sa mga errands, computer work para kay Alit, transportation and preparation of the things needed para sa aton party . Thank you so much for having the presence of mind and being available at the right moment to present our gift for the Consul General. Myrna Villa - thanks for helping your sisters in the preparation kung ano ang nagaka-igo maskin gamay lang ang imo turog just to make sure everything is right. 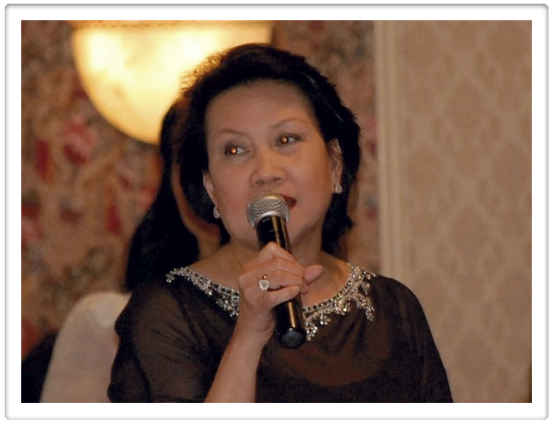 Pert Villadares- I know you used up your minutes in your cell phone just to make sure that many of our Kasimanwas were notified of the event and the guests were well informed. Thank you so much for your coordination work. You missed one of our planning meetings so you could attend another event to recruit more guests for our party. You brought guests from out of state. You are one great Ambassador of this group. Salamat man for hosting our first planning meeting for the event! Pre, saludo guid ako. Salamat gid kay Girlie, Ed and family, for coordinating with the Janiuaynons in Maryland to make sure that they are notified of the event and a place to sleep after the party. Roy Armada, thank you so much for soliciting sponsors for our journals nga halin pa sa out-of-town and bringing guests. I would always get calls and emails from you late late at night. Thanks to your lovely wife Judy for helping us find the DJ, patok-na patok gid! We all enjoyed the night because the DJ did a terrific job, projected a welcoming and warm personality and always had the presence of mind to keep the ball rolling – there was never a dull moment! Juvy Acanto-Gonzales for helping solicit journal sponsors. Always on-call and ready to help maski masako sa obra. ‘Nay Ding Acanto for making an effort to contact ang ana contemporaries to be present sa aton ugyon. We had representation from the senior citizens because of Nay Ding. Cecil Armada and Christine Sendino, thanks for helping the welcome committee, for folding the program brochures and their distribution sa mga table. Oya Solania, for readily agreeing to our last minute request to be our bamboo clapper for theTinikling Dance. To the second generation Janiuaynons for helping out in ushering the guest to their designated seats. Kung may nalipatan ako, just let me know…my deepest thanks, SALAMAT GID! ROY ARMADA POSTED HIS UGYON PICTURES IN THE JANA GOOGLE WEBSITE. TI GIYA DUN ANG GINAHULAT NATON... BONDAK.. BONDAK GID TUOD. SALAMAT GID. VIDEO CLIPS AND OTHER PHOTOS TO FOLLOW. WE ARE MOST GRATEFUL TO OUR PREVIOUS PRESIDENT IKE BUSCAR. MGA KASIMANWA.... WISH YOU WERE HERE GID KAGAB-I. ISPUTING KAG NAKA-SAYA ANG MGA KASIMANWA, ALL WEARING A SMILE WITH THAT JANIUAYNON PRIDE. DURO GID NAG-ARABOT, WE EXCEEDED THE RESERVATION. THE PROGRAM AND INDUCTION WENT WELL GID. OUR CONSUL GENERAL CECIL REBONG WAS WARM AND EXCITED TO JOIN THE FUN. OUR NEW OFFICERS AND MEMBERS WERE ENTHUSIASTIC AND DETERMINED GID. DAW KANAMI LANG ANG PAMATYAG KA TANAN SA PAGBUYLOG! THE SPEECHES WERE SHORT YET MEANINGFUL. NAGA GUTOK ANG DANCE FLOOR, EVERYWHERE THERE WERE FRIENDLY DANCE INSTRUCTORS. - INCORPORATED IN OUR 'COFFEE-TABLE' LIKE SOUVENIR PROGRAM. DAW HOTCAKE GID ANG JOURNAL FOR EVERY FAMILY AND UGYON SUPPORTERS TO BRING HOME. DURO GID ANG IRISTORYAHANAY KAG HIRIDLAWANAY KA TANAN, BISKAN SA DIIN LANG IKAW MAGLISU SA HALL MALIPAY KA GID. BONDAK - BONDAK GID ANG KASADYA AS PREDICTED EARLIER BY EDWIN ESTANIEL. THE SPIRIT OF UGYON JANIUAYNON IS BORN ! FR JOE CORNELIA OF ARIZONA EMAILED US THE 'UGYON PRAYER' BELOW (ORIGINALLY POSTED IN THE HOMEPAGE DURING UGYON DAY). THE PRAYER WAS MADE OFFICIAL AS THE INDUCTION & UGYON PRAYER CAMPAIGN. Almighty and Eternal God you know the longings of men's heart and protect their rights. In your goodness bless and watch over the leaders and members of JANA as we celebrate UGYON JANIUAYNON 2009 so through our efforts of all Janiuaynons here in the US and everywhere may enjoy freedom, security, unity and peace. Lord pour out on us Janiuaynons the spirit of understanding, truth and peace. Help us to strive with all our hearts to know what is pleasing to you, and when we know your will make us determined to it not only for the good of JANA and our respective families but for the good of every Janiuaynon around the world. Heavenly Father, you guide everything in wisdom and love. Accept our prayers of thanksgiving we offer for giving us Janiuaynons in this part of the world whose humble purpose is to unite and be of support to every Janiuaynon and every Filipino who are in need. Loving Father listen to our prayers we offer for our Beloved Mother Town Janiuay; by the wisdom of our leaders and integrity of every Janiuaynon, may harmony and justice be secured and may there be a lasting prosperity and peace. DURO GID KANAMI ANG PRAYER NGA DYA... SALAMAT GID FR JOE. THIS PRAYER INSPIRES US TO GO BEYOND OUR BOUNDARIES AND LINK WITH ALL OUR KASIMANWA WORLD WIDE. OUR UGYON PROGRAM IS READY NA. RAK EN ROL NA. BONDAKANAY GID. DATE WE HAVE 241 CONFIRMED ATTENDANCE, MGA KASIMANWA KAG MGA KAABYANAN. OUR SOUVENIR PROGRAM OR JOURNAL IS HOT OFF THE PRESS GID! 'UGYON JANIUAYNON' THAT WILL SURELY BECOME OUR TRADITION HERE AND PERHAPS BACK HOME. AND TO ENJOY BEING TOGETHER WITH A MISSION... BONDAK. BONDAK GID! TO ALL MEMBERS SALAMAT GID KA KAPISAN NINYO SA PAG SOLICIT PARA SA JOURNAL (PROGRAM) NATON, DURO ANG GUSTO MAG SPONSOR KAG MAG BULIG KANATON. MADAMOL DUN ANG UGYON JANIUAYNON 2009 JOURNAL, DAW SA 7O PAGES DUN TULAD, MORE THAN 30 PAGES DUN ANG NADUGANG SA ORIGINAL PLAN. PHILIPPINE CONSUL GENERAL CECILIA REBONG CONFIRMED NGA MA ATTEND KAG MAG INDUCT KA MGA OFFICERS. SHE WILL ALSO BE OUR KEYNOTE SPEAKER FOR THIS OCCASSION. ANG ATON MAYOR SA JANIUAY, DR BEN MARGARICO NAGAPANAMYAW MAN SA TANAN NGA KASIMANWA KAG MGA ABYAN. SALAMAT GID. WE ARE LAUNCHING OUR NEW PROJECT - BOOK DONATION DURING UGYON. PLEASE BRING ALL YOUR UNWANTED BOOKS PARA I-DONATE NATON KAG MAGAMIT PA KA MGA KABATAAN SA JANIUAY. PLEASE CLICK TO READ MORE ABOUT THIS PROJECT. OUR VENUE HAS BEEN ARRANGED AND OUR COMMITTEES ARE BUSY GID. DURO ANG NAGREGISTER TO ATTEND. MGA KASIMANWA NATON FROM OTHER STATES EXPRESSED THEIR INTEREST TO JOIN US FOR THIS SPECIAL UGYON NIGHT. OUR FELLOW ILONGGOS AND OTHER ASSOCIATIONS FROM OTHER TOWNS (IN ILOILO) AND GROUPS HAVE ALSO ASKED US TO RESERVE TABLES FOR THEIR GROUP TO CELEBRATE WITH US. TI DAW SADYA GID DYA..... BONDAK... BONDAK GID. for meaningful and lasting projects para kanaton kag sa pinalangga ta nga banwa sa Janiuay. Date and Time: February 28, 2009 at 7:00 P.M.
We are also soliciting sponsorship for the souvenir program. Please check the attached contract form for your information. On behalf of the 2009 Incoming Officers, I am looking forward to your participation. Malipayon nga paskwa kaninyo nga tanan and may our Lord shower you with His blessings sa bag-o nga tuig. below are attachments you can save, print and distribute. Just click once and wait to direct you to the Janiuay.net website. or post them in our guest book. Thanks.